Two cellophane packaged 0.33 oz. maple leaf candies with ribbon and tag. Seashells! What a great idea! We can't take credit for this maple candy wedding favor. Turns out that lots of New Englanders get married near the ocean, so it's only fitting that two great things should come together - pure maple candy and an ocean shape! Seashell maple candies aren't a new idea, but as a Vermont wedding favor it is unique. Two 0.33 oz. 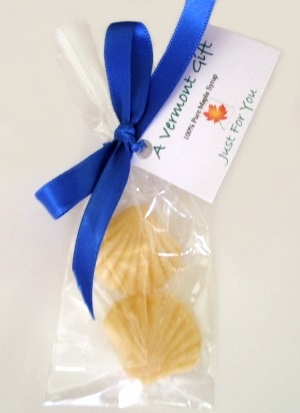 seashell-shaped maple candies are packaged in food safe cellophane plastic and tied with a decorative ribbon and tag. This Vermont wedding favor is 100% pure maple sugar candy. Everyone expects to see chocolates at a wedding reception party. What they don't expect is Vermont maple sugar candy. You may want to order a few extra as they're sure to disappear fast, leaving guests asking for more! We charge a flat rate for packing and shipping of Seashell maple candy wedding favors, which will be determined during CHECKOUT. Your favors will arrive via the United States Postal Service (USPS) Priority Mail. Local, hand-delivery is also available in the northern Vermont region. Sale Price: $3.35 You Save: $0.15 (4.29%)! Sale Price: $3.10 You Save: $0.40 (11.43%)! Sale Price: $3.05 You Save: $0.45 (12.86%)!